In its infancy, Chasing Amazing was a blog that was as much about my collection of Amazing Spider-Man comics as it was about Spider-Man himself. But as is often the case in life, my site needed to adapt and evolve to survive, and I started introducing new features and more straightforward content, that in turn, generated more readers for my friendly, neighborhood blog. Still, as a postscript to all of the Venom content I’ve been publishing over the past month, I wanted to get back to my roots by using a classic issue as a springboard to talk about issues related to collecting comic books. I thought ASM #299 was a great choice to do a post like this because, let’s be honest, nobody gives a crap about this issue based on its story (if I offended the three Chance fans who read my blog, I apologize). This comic is important because it marks the first appearance of Venom. Or does it? From a collector’s perspective, Venom’s first appearance is ASM #300. Collectors know this to be true because of the issue’s exorbitant price tag (which is caused by the fact that it’s the first appearance of a very popular character, and is thereby deemed “collectible”). But this is one of the things about collecting comics that really bothers me. Who is the judge, jury and executioner of these executive decisions (besides the Overstreet Price Guide)? I’m reading a copy of ASM #299 right now and see a full body image of Venom – speaking! – right in front of me. 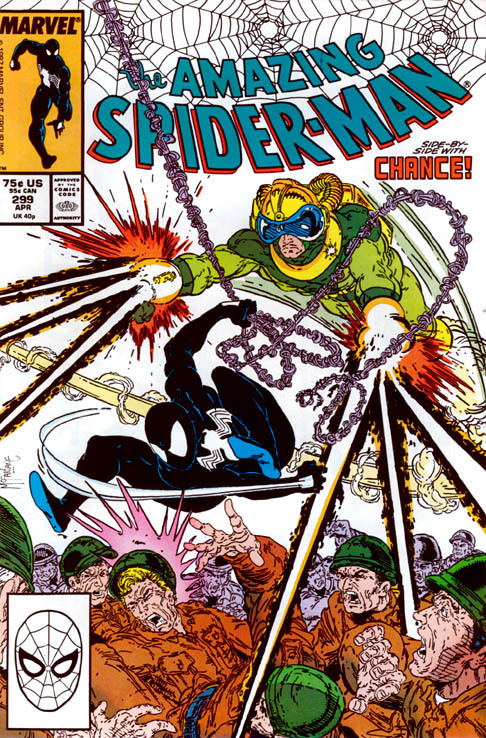 ASM #299 features the same creative team (David Michelinie and Todd McFarlane) as ASM #300. So why isn’t #299 the highly sought-after comic for collectors? Fans of a certain Canadian mutant probably ask themselves the same question. Incredible Hulk #181 is considered the holy grail of Bronze Age comic books because it marks the first appearance of Wolverine. And yet, anyone who’s actually read the issues will know that Wolverine actually appears (and introduces himself to the Hulk by name) one issue prior on the last page of Incredible Hulk #180. Retailers and price guides naturally have an explanation for all this. Issues like ASM #299 and Incredible Hulk #180, are considered “cameos,” while the succeeding issues are marked by first “full appearance.” Okay, but now it seems like we’re arguing semantics. What distinguishes a “cameo” from a “full appearance?” Better yet, how is a full body shot and a line of dialogue threatening the hero (or his wife) merely considered a “cameo?” You want to tell me that Venom’s shadowy monologue in ASM #298 is a cameo? I’ll buy that. We never see his face. We have no idea who this character is. But one issue later, Michelinie and McFarlane are dedicating two whole pages of the script to this guy, plus they have physically defined him by having him step out of the shadows. How do you explain the collectability of ASM #238 vs. ASM #239? In this instance, ASM #238 marks the first appearance of the Hobgoblin … and it’s a cameo (he only appears, in full, on the very last page, though we have about four pages of set-up showing a shadowy figure getting into his costume). ASM #239 is the first “full appearance” of Hobgoblin. But in terms of collectability and value, the cameo is the more lusted after comic than the first full appearance. (Update: It would appear I misread the designation of “cameo” in the mycomicship product description, as on second look, the site appears to be referencing a Mary Jane cameo. You could probably ignore my ASM #238/239 example … or should you?). Does any of this actually matter in the grand scheme of things? No. The whole designation of “collectible” is a mostly arbitrary thing that is affected, to some degree, by supply and demand, but is mostly driven by speculation and hype. In general, a comic book becomes desired because of a character’s first appearance, or a landmark event, and from there morphs into a self-fulfilling prophecy of collectability and value. If retailers and other collectors along the way thought Venom’s first cameo in ASM #299 was the more valuable comic than his first full appearance ASM #300, that would probably still be the case today. Instead, I remember searching every comic book shop and show I could find near my home on the South Shore of Long Island growing up, trying to find an attractive but affordable version of ASM #300, because THAT was the comic you wanted to own as a Venom fan. The day I finally made that purchase, I felt completely validated as a collector and a Spider-Man fan. It wasn’t until years later that I opened up my “big box of comics,” that I received my copy of ASM #299. It’s not that it’s not a special comic, but it never had the emotional or monetary value assigned to it that drove me to the point of obsession to own it. I’ve often wondered the same thing in connection with the first appearance of the black costume. Growing up, everyone knew that was Secret Wars #8. It wasn’t until I got older and realized the timing of everything that it became apparent that the black costume was appearing in Amazing (granted, without explanation) for months before Spidey actually acquired it in Secret Wars. Yet Secret Wars #8 is credit not as the issue where Spidey first gets the costume, but its first appearance, even though it appeared for months before then. Gambit is a problem similar to Venom – everyone credits his first appearance as Uncanny X-Men 266, even though he appears in X-Men Annual #14, which came out a month before #266. Granted, the story in the annual obviously takes places after the story which begins in #266, but if that’s the case for deeming #266 his first appearance, then the first appearance of Wolverine should be Origin #1. Like you say, it’s all ultimately arbitrary and kind of pointless, but I wanted you to know you’re not alone in being bugged by it. I take your point to some extent, but I’m not sure I agree 100% with regards to your chosen examples. I wouldn’t call ASM 238 a Hobgoblin “cameo.” For one thing, Hobby appears on the cover. His actions drive the second half of the story, and the first half is devoted to setting up his debut (e.g. explaining who Norman Osborn was, why Goblins are a big deal for Spider-Man, and so forth). Contrast this with ASM #299, where Venom is a last-minute cliffhanger in an otherwise lame story about Chance (actually is there another kind of story about Chance?). Even as cameos, however – and perhaps you don’t know since you found them in the big box – ASM’s 298 and 299 do not come cheap (I paid $55 for the pair in FN condition). This to me is where the randomness of the designation “collector’s item” becomes apparent. The true first cameo appearances of Venom happened months earlier in issues of Web Of Spider-Man, any of which can be purchased for less than a dollar. Why these issues – in which Venom, unseen, attacks Spider-Man – aren’t valuable collectors’ items will always be a mystery to me (a happy mystery, mind, since I would not want to have spent more than 90 cents on comic books of that quality). As for the actual coast of 298/299, that’s true. They’re not (relatively) cheap, though 298 is also slightly inflated for being McFarlane’s first issue, not (only) because of Venom. Can’t explain the price discrepancy with Web of, though that obviously only proves my point further about this arbitrary designations. I’ve always referred to ASM #299 as Venom’s first appearance and I always thought part of the reason ASM #300 was more expensive was because it’s issue 300 and the 25th anniversary issue, to go along with being the first full Venom story. ASM #300 was a hole in my collection for a long time, but over the last couple of years I picked up a decent looking copy at a good price at C2E2 and then was thrilled to pick up a really nice copy at my LCS, which I got a great deal on. My stance on ASM #299 is this. It’s not worth or desired as much as the collosial 300 simply because Venom’s motivations have not yet been revealed. 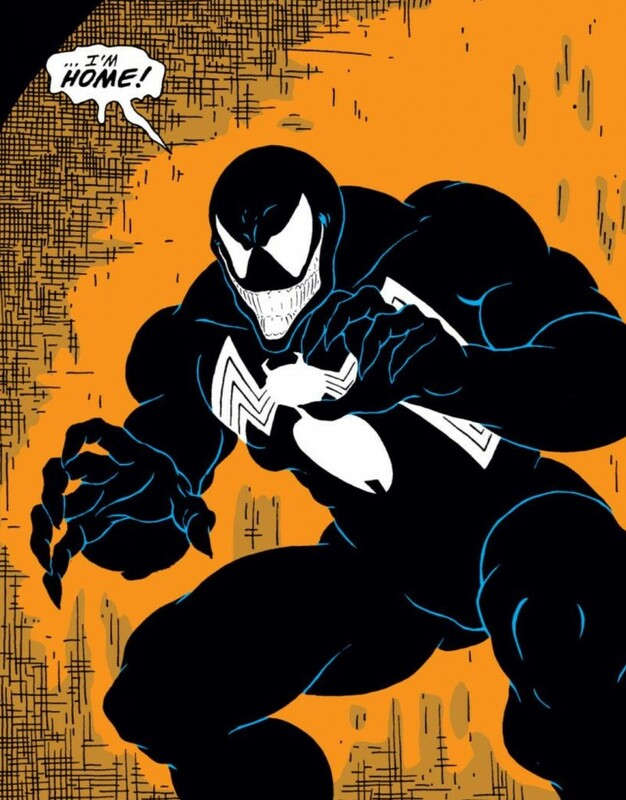 In Spider-Man 299 Venom is just an overmuscular Spider-Man with a ginning mouth. Collectors will typically breeze by the story and throw off his one shot appearance as just a cameo because there’s nothing for the readers to connect to yet. 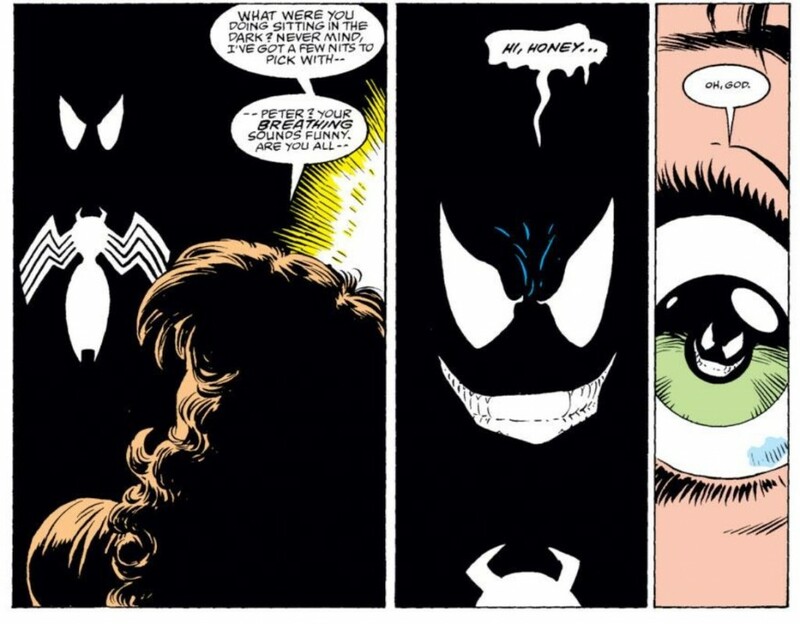 Venom became THE Spider-Man villain during the very late 80’s and early 90’s because of this landmark 300th issue, because of this newly revealed motivation. The symbiote knew Peter inside and out, and used Brock’s equal hatred to destroy him. Spider-Man’s spider sense was ruled ineffective since his extrasensory perception never considered the symbiote a threat once the two bonded for awhile. A villain that could block this ability with no mechanical or chemical interference really kept the hero on his toes and paranoid whenever Brock’s name was mentioned. Mary Jane one of the strongest of all normal female characters was scared witless by the sheer sight of him. When has that happened in ASM? All these things readers had yet to experience in a Spider-Man comic book. This was the first time since Hobby that readers had a character that could potentially end Spider-Man. It was exciting! Just how was Peter going to save the day. All of that was due to issue 300.